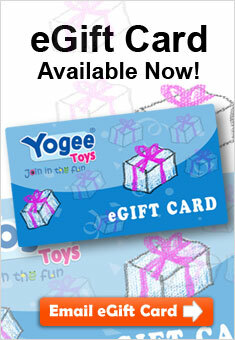 Help your child transition to toddler and beyond with Yogee Toys! Your toddler can get on the move with trikes, wagons, and push carriages. Expand your kid’s imagination with jungle, automobile, and pirate play sets and dress-up costumes. Tap into your toddler’s creativity with Play-Doh, Lego Duplos, Mr. Potato Head and enough musical instruments to form an orchestra! Help your child learn while playing with books from Usborne and toys from VTech and Melissa & Doug. Comfort your child with their favorite characters from Thomas & Friends, Winnie the Pooh, Bananas in Pyjamas, and Disney—all from Yogee Toys!